Do you read? Or how often are you learning a new skill? 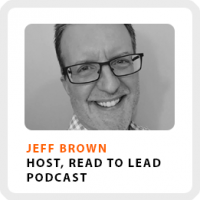 Jeff Brown shares how crucial it is to create a learning habit to increase and even maintain your value in today’s economy. He’s the host of the popular Read to Lead Podcast. Each week he breaks down key lessons from books on leadership, as well as interviewing authors of must read leadership books! As of the recording of our interview, Jeff has read 300+ books on leadership! We’re going to dive into how and why he started his reading habit, as well as why he decided to turn his love of reading into a weekly podcast. Jeff’s method for “active” reading and why he doesn’t always finish the books he reads. How his side hustle turned into a life preserver when he got laid off from his job. We have an extensive discussion on how to develop a mastermind and why it helped him develop his business more quickly. Wake up time: Usually no later than 6:00 am. Core work activities + habits: 1) Scheduling activities, list the top 3-5 things he needs to spend time on and schedule time for them. 2) Setting aside a day each week to take a date day with his wife. 3) Having a cloud accounting software solution to sync financial information. Definition of success: The ability to say no to the things he doesn’t want to do. 90-day goal: Begin writing a book and finish the first two chapters. Create $50,000 in new revenue.